“This is probably as close to a red-throated loon as you’ll ever get,” my son Mark said to me. We were standing a mere 15 feet from a red-throated loon that was floating on the acre-and-a-half reflecting pool at the Penn State Altoona campus. The loon had been hanging out there since March 30, having arrived during a huge fallout of waterfowl throughout our area in west central Pennsylvania. I watched as students streamed past the pool, most of them unaware of the star waterfowl surrounded by the usual gang of mallards. But the loon was more like the shunned “other,” a solitary royal on its own amid the commoners that dared not approach it. The loon had a long way to go before it could begin breeding in low tundra wetlands, bogs or forest ponds from Alaska east to Labrador and Newfoundlnd. Here in the East, red-throated loons spend the winter mostly along the Atlantic coast from Newfoundland to Georgia, but at least a few winter in lakes as far west as Bay Spring Lakes in Tishomingo, Mississippi, according to a February 25, 2018 eBird report that listed one wintering red-throated loon as well as 92 common loons. Red-throated loons, Gavia stellata, are the smallest and most slender of the five loon species in North America. Breeding adults have pearl-gray heads and necks, which the Penn State Altoona loon had but not yet the rust-red patch on its throat that distinguishes it from other loons—common, yellow-billed, Pacific and Arctic—all of which are variously patterned in black and white. In addition, red-throated loons have long, thin bills that tilt upwards. Red-throated loons also differ in behavior from their congeners. They can take off directly from land instead of requiring a quarter-mile-long patter on top of a larger body of water such as common loons need. Furthermore, red-throated loons don’t carry their young on their backs, again like other loon species, and they forage for food on lakes and even the sea a distance from their breeding territory unlike their congeners that feed on their breeding lakes. Here in Pennsylvania red-throated loons are uncommon to rare migrants and previously were seen mostly on the lower Delaware River and Lake Erie. For instance, back in 1997 a momentous 200 red-throated loons migrated over Lake Erie, but the usual yearly count is eight. However, all the impoundments in the High Plateau, Ridge and Valley and in the Piedmont away from the Delaware and Susquehanna Rivers, according to Gerald McWilliams and Dan Brauning in The Birds of Pennsylvania, may also encourage more red-throated loons to migrate through Pennsylvania. Still, the North American Waterbird Conservation Plan calls it a Species of High Concern because of its population decline in North America and northern Europe perhaps due to oil spills, habitat degradation, or entanglement in fish nets, although scientists are not certain about this and need to do more study of these birds. Once we had admired the red-throated loon, Mark and I headed to Lake Altoona, which he had previously visited with two environmental ethics students at the beginning of the waterfowl fallout. The weather late in March had been unusually cold and windy with frequent snow and rain, and on March 30 they had identified 26 species, most notably 100 redheads, 40 greater scaup, 40 lesser scaup, 100 horned grebes, 25 long-tailed ducks, 100 red-breasted mergansers, and 30 common loons. During our visit on April 6, three students joined us and we found 24 species in all. That afternoon it gradually warmed to a blustery 50 degrees, and it was partly sunny. The waterfowl numbers had declined from March 30 to six redheads, six greater scaup, three horned grebes, 16 red-breasted mergansers, no long-tailed ducks, and only three common loons, but the loons were below the dam breast of the impoundment, a source of Altoona’s drinking water, and were close and easy to see directly beneath us. Unlike red-throated loons, at least one pair of common loons nested in Pennsylvania as late as 1946 on Pocono Lake in Monroe County. But since then the nearest breeding common loons are in the Adirondack Mountains of New York. They also breed across Canada, New England, and the upper Midwest. Best known for their weird, maniacal calls and wavering cries, common loons in their breeding plumage of black heads and necks, the latter with necklaces of black-and-white horizontal stripes, and checkered black-and-white backs look as elegant as men in tuxedos. But in the fall and winter their stout, black bills are light gray, and their bodies are gray-brown above and white below. Along central Pennsylvania ridges they are common migrants, and I have heard them call occasionally when flying over our ridgetop in the spring. In fact, the same day we were looking for waterfowl, hawk watchers atop nearby Tussey Mountain counted 16 common loons flying north. However, common loons almost lost their commonness during the last century. Because they need clear, clean lakes to dive for fish, build their nests, and raise their young, they cannot tolerate pollution, development, and disturbances. In the mid-twentieth century, breeding loons began disappearing across North America from California and Oregon, the Midwest from Iowa to Ohio, and from eastern Massachusetts and Connecticut. Then, shortly after the Clean Water Act was passed in the 1970s, they staged a comeback, returning to Massachusetts with 45 breeding pairs on 20 lakes throughout the state by 2015. Across the Great Lakes and the northeast they returned to nest in lakes they had deserted decades before. Best of all, from our standpoint, was the recovery in the Adirondacks. Down to 200 pairs, there are today between 600 and 850 nesting pairs from the Adirondacks to the Finger Lakes. Altogether, the total North American population is about 250,000 nesting pairs. While these numbers are encouraging, biologists say that loon numbers are still well below historical numbers. Common loons can dive 75 feet deep and swiftly chase after their fish prey underwater. But they also pick up what appear to be pebbles on the lake bottoms in their gizzards which they need to grind up the fish they eat. Often, the “pebbles” are lead sinkers and jigs from fishing tackle, and when they reach their gizzards, they poison the loons. In only a few days, the loons can’t eat, they are paralyzed, and they die from exposure, suffocation, and starvation. A study of this problem in New Hampshire from 1989 to 2012 by biologists, with the help of citizen scientists, resulted in a paper that found that 49 per cent of 253 dead loons had died from lead poisoning. In New York a similar study found that lead had been responsible for between 15 to 21 percent of loon deaths. We continued watching other waterfowl at Lake Altoona including two blue-winged teal, two gadwall, three American wigeons, a tundra swan, 10 northern shovelers, 50 ring-necked ducks, 10 buffleheads, two common mergansers and four pied-billed grebes. Eight Bonaparte’s gulls flew overhead. Canoe Lake is 155 acres, much larger than Lake Altoona, and provides excellent resting and feeding stopover for waterfowl. By the time we arrived, in late afternoon, it had clouded over and the wind blew at gale force, whipping up waves that made it difficult to spot waterfowl. But we set up our scope and scanned the lake. We located a flock of seven common loons, two gadwalls, three mallards, five buffleheads, 14 red-breasted mergansers, two ruddy ducks, two pied-billed grebes, and 10 American coots. Fifteen double-crested cormorants landed on the water with wings spread like huge bats and two killdeer ran along the sandy beach. Without Mark’s help, I doubt I would have seen as many waterfowl, but, in addition to the loons, my favorite sightings were the white-cheeked, dark-capped, rusty-red male ruddy ducks, the puffy-headed, black-and-white buffleheads, the crested red-breasted mergansers, and, best of all, the stunning golden crowned horned grebes. The grebes, too, were heading far north to breed on lakes and ponds from the Brooks Range in Alaska east to the western shore of Hudson Bay. In fact, almost all the waterfowl we saw that day were only passing through the state for places to breed far to the north or west of us. That is why I make it a practice every spring to visit nearby lakes to admire these birds in their gaudy, breeding attire. Early April is the time to see migrating waterfowl on every pond, lake, and river in our state, and last spring was no exception. On a warm, breezy, April day, led by our birder son, Mark, my husband Bruce and I took an all-day tour in search of ducks, geese, and other assorted waterfowl. Mark had spent much of his spare time exploring the best places to bird in Bald Eagle Valley and beyond and wanted to share them with us. Our first stop was the Julian Wetlands, renamed the Tom Ridge and Julian Wetlands by the Wildlife for Everyone Foundation. This privately funded organization, located in State College, was founded in 2004 to promote wildlife conservation and education in Pennsylvania and is committed to maintaining habitat for our 480 species of birds and mammals as well as our fisheries according to their website. In 2002 the WHM Group, Inc., in State College had been hired by the Pennsylvania Department of Transportation to construct the Julian Wetlands on both sides of Alternate Route 220 as mitigation for the environmental impacts caused by the building of Interstate 99 on Bald Eagle Mountain. 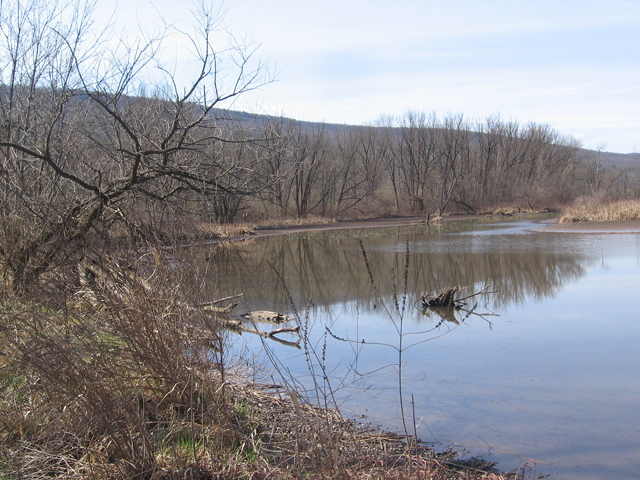 The scientists working for the WHM Group chose the location based on existing water sources, both from the Allegheny Plateau run-off on the Julian Wetlands side and Bald Eagle Creek saturation feeds along the riparian wetland on the south side of the highway. These waters enabled them to construct wetlands without using large machines. 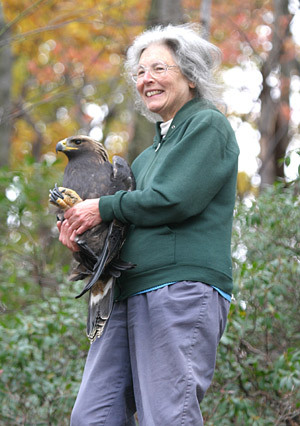 The WHM Group, Inc., gave the property to the Wildlife for Everyone Foundation in 2004. That was when the Foundation dedicated the property to Tom Ridge, a former Pennsylvania governor, prominent conservationist, and honorary board member, hence its name change. The property consists of 135 acres—55 acres of man-made wetlands, 15 acres of riparian wetlands along Bald Eagle Creek, and 65 acres of upland forest and meadows. 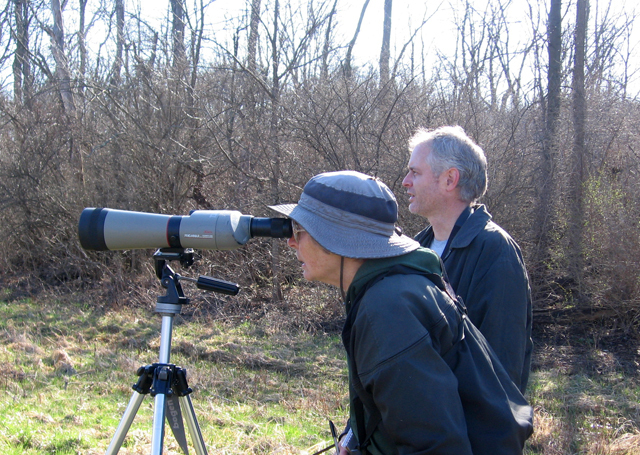 Naturalists, particularly birders, have been documenting wildlife species there since it was constructed. Already more than 180 bird species have been seen on the property. The Foundation plans to build a mile-long, accessible, mostly boardwalk trail around the 55-acre wetland, birding blinds, and an education pavilion with observation platforms. But on the day of our visit, we found that the rudimentary wetland trail was overgrown and wet. Another birder we met told us that getting around on it was practically impossible so we birded along the country side road where we had parked our car. Many newly-arrived tree swallows swooped over the water, a pair of Canada geese called, a swamp sparrow emerged from the underbrush, and those signature spring birds of wetlands, the red-winged blackbirds, sang their “Okalees.” We also saw a pair of eastern bluebirds, a northern mockingbird, and several song sparrows. But the only migrating waterfowl we spied was a brown female redhead, half-hidden by the dried plants in front of the water. The next mitigated wetland we visited, the Curtin Wetland, is a mile north of the Milesburg Exit for Interstate 80. 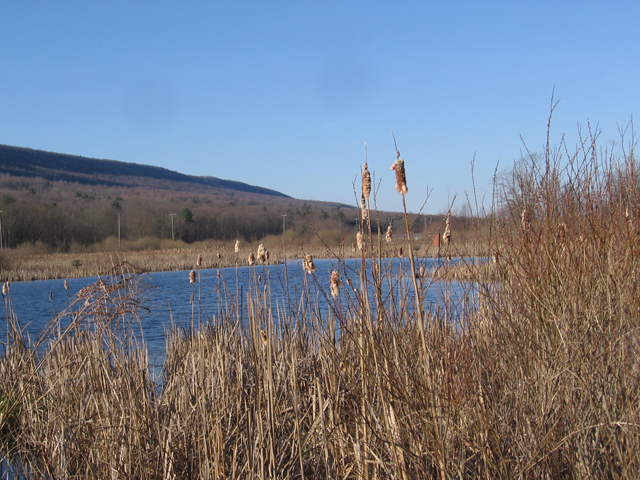 Tucked between Pa. Route 550 on one side and Bald Eagle Creek on the other, this wetland had been constructed about 30 years ago, is owned by the Army Corps of Engineers, and managed by the Pennsylvania Game Commission. We carefully picked our way over a muddy trail beside a field of teasel. In the middle of it an American kestrel nest box hosted a pair of the small, handsome raptors. Aggressive tree swallows occupied other nest boxes and repeatedly dove near our heads. Finally, we reached the dike area and climbed up to an overlook of the extensive pond, where we set up our scope. The water teemed with waterfowl, and after much staring through binoculars and scope we added 10 more waterfowl species to our list. Close in was a flock of ubiquitous mallards, the handsome, green-headed males riding herd on the brown females. Next I looked up when I heard and then saw the beautiful, multi-colored male American wood duck and the brownish gray female with her white eye patch flying overhead. Both mallards and wood ducks are dabbling ducks because they feed by “dabbling” with their bills to pick up material from the surface of the water or by upending their bodies, heads under the water and tails in the air. Mallards are the most widespread and abundant resident duck species in Pennsylvania, closely followed by American wood ducks. But the gray-bodied male and brown female gadwall ducks we spotted are dabbling ducks that are migrants on their way north and west of the commonwealth. According to The Second Atlas of Breeding Birds in Pennsylvania, the last gadwalls that bred in the state were recorded in 1964 in Conneaut Marsh near the border with Ohio. Blue-winged and green-winged teal are also dabbling ducks and flocks of both species swam in the pond. The white facial crescent and blue patch on his forewing are the male blue-winged teal’s most identifying characteristics on a mostly brown body. The slightly smaller green-winged teal male is known by his green head patch on a chestnut brown head and his mostly gray body. Females of both species are primarily brown. Blue-winged teal breed in temporary wetlands surrounded by healthy grasslands while green-winged teal prefer dense emergent marshes and shrubby swamps. Both species are still listed as breeding birds in Pennsylvania but green-winged teal have always been rare because most breed farther north and west of us. On the other hand, blue-winged teal used to be more common breeders here but their numbers fell between the first (1983-89) and second (2004-2009) atlasing periods. However, on that day at the Curtin Wetlands, green-winged teal repeatedly flew in tight flocks overhead and blue-winged teal remained feeding on the water. Farther out in the pond were several diving ducks that forage by diving under water. Most abundant were the male and female ring-necked ducks, noticeable for the white ring near the tips of the bills of both sexes. Still, they are named for the maroon band around the male’s neck that is almost impossible to see under the best light conditions. Ring-necked ducks nest in the boreal belt throughout Canada. A few lesser and greater scaup, look-alike bay ducks, also headed for boreal Canada, and a lone female hooded merganser rounded out our duck list, the latter an uncommon breeder in Pennsylvania, nesting in tree cavities beside lakes and wetlands, especially beaver impoundments. We also spotted a flock of American coots, members of the rail family that pump their heads back and forth as they swim. Mostly black and slate gray with bright white bills, they both dabble and dive. They too are rare breeders in Pennsylvania because we lack large freshwater marshes interspersed with open water which is their preferred habitat. Our final waterfowl there was a handsome, male horned grebe, his golden plumed head standing out from his rusty brown neck and body. He too was headed northwest to boreal lakes in western Canada and Alaska. Bald Eagle State Park and the Army Corps of Engineers’ Foster Joseph Sayers Dam were our last destinations for the day. We had visited the larger fields and lake of Bald Eagle State Park, but Mark had sought out the smaller access areas beginning with the Bullit Run Access where we saw a small flock of common mergansers, followed by the Sunken Run Overlook that yielded two common loons and seven buffleheads. Sometimes I hear a common loon call as it flies over our mountain home during migration so I was pleased to see them in their dapper black and white breeding plumage. They nest on large lakes throughout the boreal forest and tundra and were last seen nesting in Pennsylvania at the Pocono Lake in Monroe County in 1946. Buffleheads are also small diving ducks that are studies in black and white. The adult male has a large, puffy, black head with a prominent white patch on it along with a black back and white sides. They were on route to breeding grounds in Canada and Alaska. We ended our day near the dam breast. With a sighting there of red-breasted mergansers, we had seen all the merganser species. Known for the females being as distinctly plumaged as the males, they are brown-crested with grayish bodies, while the males are variations of black, white, and brown. All are diving ducks. The medium-sized red-breasted merganser breeds in northern Alaska and Canada next to lakes and rivers in the boreal forest and tundra. The common merganser is the largest and the hooded the smallest. All have long, spike-like bills and saw-edged mandibles. We also added pied-billed grebe to our list. Like the horned grebe, it has toes that are lobed rather than webbed and tiny tails. The male has a short, black-banded bill that gives it its name. It nests on ponds and lakes, even in Pennsylvania, with emergent vegetation. As species 18 it ended our productive day of chasing waterfowl.